Our modern and freshly refurbished Maclean/Trailfinders building has a large hall with toilets and washrooms with hot water. 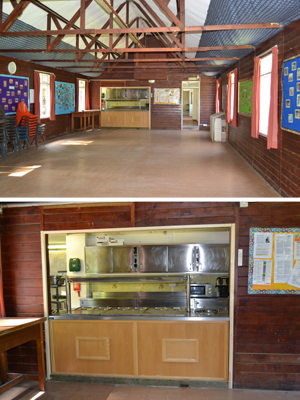 The kitchen includes a 6 burner gas cooker, 3 double ovens, fridge and freezer so makes catering for large numbers easier. There is also a camping field adjacent to this complex for your sole use. Maclean is a large hall with full stainless steel kitchen, large capacity fridge, large capacity freezer, dishwasher and utensils etc to cater for large numbers. 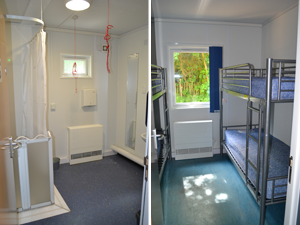 Trailfinders is brand new and provides sleeping accommodation for 40 people with disabled access rooms and toilet/shower facilities. 10 bedrooms each sleeping 4 people in double bunks. Bed linen is not provided. Male and female toilets and showers. Cost includes: All lighting, cooking and heating and camp fees for up to 40 persons as well as kitchen utensils, cutlery, mugs, plates and bowls. A large hall attached to the Maclean building. 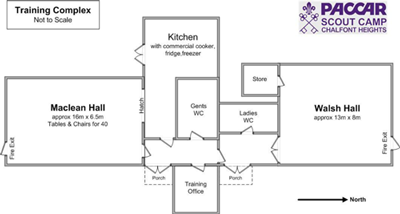 This Building is designated and set up as a full time training room with its own tea bar facility.